Individual and Dual Sports provide students with opportunities to acquire knowledge of strategies and develop skills in selected individual and dual sports, and maintain and/or improve their personal fitness. The content includes knowledge and application skills, techniques, strategies, rules, and safety practices. Individual and dual sports selected may include but not be limited to other sports. This subject analyses some individual and dual sports from an educational and practical dimension. For this, it uses two principles: methodological aspects and the essence of each sport. This subject tries to discover methodological tools that allow us to consider sport not only as something competitive and technical but also as an essential component for training a person, for social cohesion and skills acquisition for health. It is necessary to know the essence of each sport from a technical, tactical and practical point of view to identify more characteristic elements and to know how to adapt and apply them in the educational process from a motor point of view as well as attitudes, rules and values. On the other hand, the reader may notice a lot of entries from the internet as the entire book is being read. The internet is a very good source of information but also contains a lot of unpolished and unreliable information. Rest assured, materials sourced from the internet were carefully evaluated according to the authors' expertise in the subject matters. The authors of this book are indebted to the persons responsible of the various sources cited in this book. Special gratitude to Mr. Jerome M. Katipunan of the Mutya Publishing House, Inc. for his trust and confidence to the authors, and more particularly, for the opportunity to contribute, in this humble way we can, in the effort to better facilitate the teaching-learning process in the tertiary level. 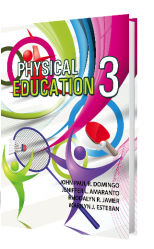 Likewise, gratefulness is due to all the teachers who will find this book useful in their classes, and all Physical Education 3 students who will, hopefully, will appreciate the value of this book in their pursuit for knowledge and skills for a better life that they all deserve.